A while ago, The New York Times ran a an article on the mainstreaming of veganism in the United States. Vegan and vegetarian diets have come a long way, helped along in part by public figures such as former President Bill Clinton, Ellen DeGeneres and Kathy Freston, and also in part by a heightened awareness of environmentalism, a focus on sustainable agriculture and the farm-to-table movement. Other people are passionate about animal rights, animal husbandry (especially here in America, where much work still needs to be done, particularly in the Midwest and the South), and factory farming. I acknowledge that although we as a nation have come far, we still have a ways to go as far as engaging the country so that Americans (and the world in general) truly cares about where their food comes from. That, however, is a topic for another occasion. 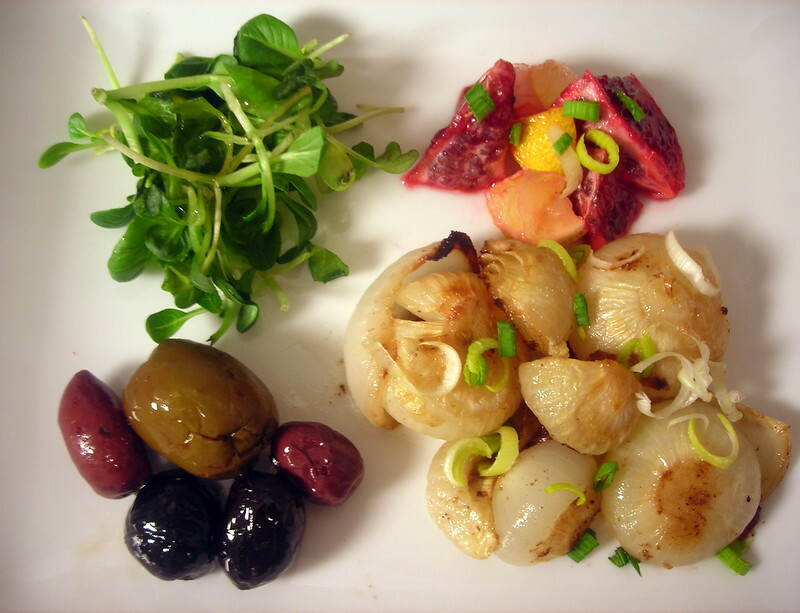 “Foursome” — Clockwise from upper left: (1) micro-tatsoi greens, dressed with hazelnut oil and lemon juice, (2) quick “preserved” blood oranges and lemon, (3) baked cippolini onion with sherry vinegar and green garlic, and (4) marinated olives. Regarding the debate of vegetables over meat, I think a more effective and inviting approach rather than going on the offensive, is to educate people about the benefits of going meatless, or, if one chooses to not fully become a vegetarian, to consider going meatless one day a week. That’s a beginning. You may find that rather than seeing the choice to go meatless as a limit, that it’s a new way of looking at food. In doing so, you may see that it’s a bit of a liberation. You may find that there are new, exciting and interesting ideas to explore that you might not have thought of before. It used to be that vegetarians, omnivores and carnivores all staked out different positions, and never was there a peaceful moment at the dinner table. I think, rather than the us vs. them mentality that so often seems to pervade the divide between omnivores and vegetarians, vegans vs. everyone else, raw foodists vs. people who like their food ‘cooked’, and so forth, that we really should be talking more about good and delicious food. That is a more interesting conversation to have, in my opinion. You may find it odd that I feature two pasta recipes in a post about “Thanksgiving”. There’s a simple explanation for that. In Part 1 of this series of posts, I talked about the menu I came up with for post-Thanksgiving dinner, which will be held on Friday, November 23, 2012. There will be a pasta course for that meal that will be lacto-ovo vegetarian. Obviously it’s not traditional, but then, I like to think out of the box when it comes to food. Besides, I don’t particularly like turkey (although I’ll eat it, just not with a great deal of enthusiasm). For the two pastas pictured in this post, you can with very little effort, tweak them slightly to make them meatless without compromising the integrity of the dish. 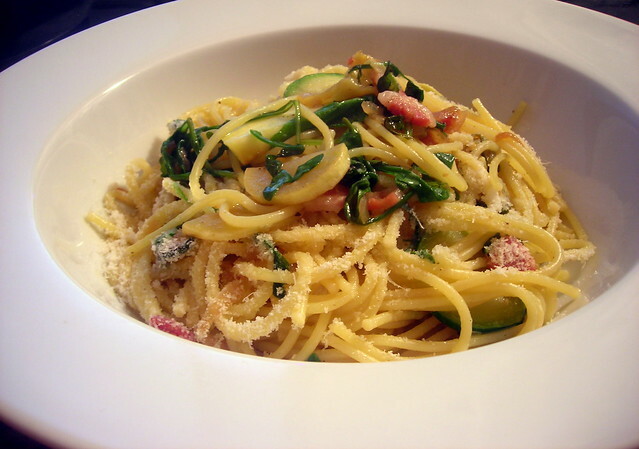 For the spaghetti with pancetta, simply eliminate the pancetta and substitute olive oil and garlic. If you do this, it then becomes spaghetti con le zucchine (“spaghetti with zucchini”), a delicious dish in its own right. For the orzo, eliminate the anchovy and use chopped wild mushrooms instead; alternately, slow-roasted tomatoes (sliced tomatoes roasted from 5 to 8 hours in a 200 F oven in olive oil, seasoned to taste with sea salt, black pepper, garlic and basil) is a delicious alternative. If you happen to be vegan, simply substitute egg-free pasta for regular dried pasta, and consider using toasted herb and garlic breadcrumbs in place of cheese. Prepare spaghetti according to package directions. Cook until al dente, then drain and reserve one cup pasta cooking water. Start the sauce with a couple of thick cut slices of pancetta, coarsely diced (or if you don’t have any, either guanciale or good-quality bacon) and a couple of tablespoons of water. Put the pancetta, guanciale or bacon and water in a skillet over medium heat. When the water has evaporated and the pancetta starts to color, drain off all but 1 tablespoon of the drippings. Add some thinly sliced onion, then add some sliced zucchini or summer squash. Add a pinch of sea salt and a couple of grinds of black pepper. Cook until the zucchini becomes golden brown, add some minced Italian parsley, baby arugula leaves and the cooked, drained spaghetti. If the pasta seems too dry, add some pasta cooking water tablespoon by tablespoon until the pasta is sufficiently moistened to your liking. Cook for 1-2 more minutes, taste for salt and pepper, then serve at once. Cheese is optional. Prepare orzo according to package directions. Cook until al dente, then drain and reserve one cup pasta cooking water. Start the sauce by gently warming some olive oil in a large skillet over medium-low heat, along with a couple cloves of thinly sliced garlic. When the garlic turns a pale gold, after about 1 minute, add some thinly sliced onion to the pan. About 1 onion is sufficient; obviously if you like slow-cooked onions, add more, but if you do add more, you’ll have to adjust the cooking time slightly. Lower heat and cook, stirring occasionally. The idea is to brown the onions slowly. This will take some time, about 15 to 20 minutes, and you’ll need to be patient. When done, the onions should be golden brown. Raise the heat to medium. Add a couple of anchovy fillets to the sauce. Let the anchovy disintegrate into the sauce by mashing on them with the back of a wooden spoon. Taste for salt and pepper. 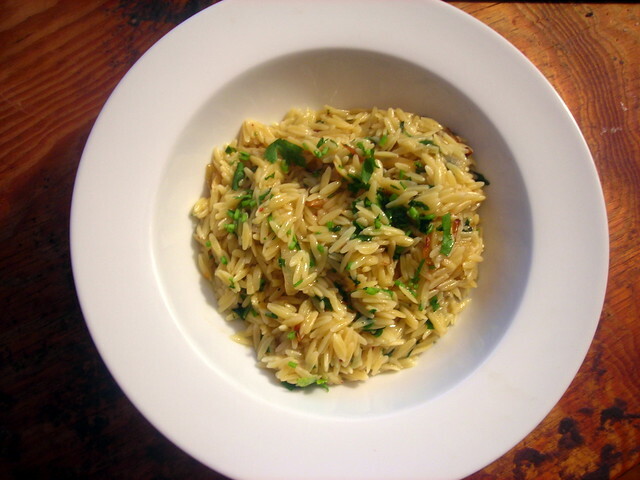 Stir in cooked, drained orzo. If the pasta seems too dry, add some pasta cooking water tablespoon by tablespoon until the orzo is sufficiently moistened to your liking. Let the pasta cook for 1-2 more minutes, then stir in some chopped Italian parsley, and serve at once. 20 Nov	This entry was published on November 20, 2012 at 4:38 am. It’s filed under autumn, food, food photography, Italian food, recipe, vegetarian and tagged autumn, cooking, dinner, food photography, Italian food, pasta, recipe, Thanksgiving, vegetarian, zucchini. Bookmark the permalink. Follow any comments here with the RSS feed for this post.